It's only been 14 YEARS, but the wait is finally over this weekend — the sequel to Incredibles is almost here! My family had an Incredibles inspired dinner last night to get in the spirit for the movie and I wanted to share it with all of you to inspire your watch parties, family dinners, and pre-movie snacks before Thursday's premiere! Personally, I really need to refresh my memory on the original Incredibles before watching Incredibles 2 because it's been a while since I've seen it. I think I was 8 years old when it came out in theaters and I probably didn't realize I would basically turn into Violet a few years later. Now let's talk food! We made Incredibles Nachos that were so good and so on point with the theme! I feel like the pictures don't do them justice, which is often the case with messy food like nachos. 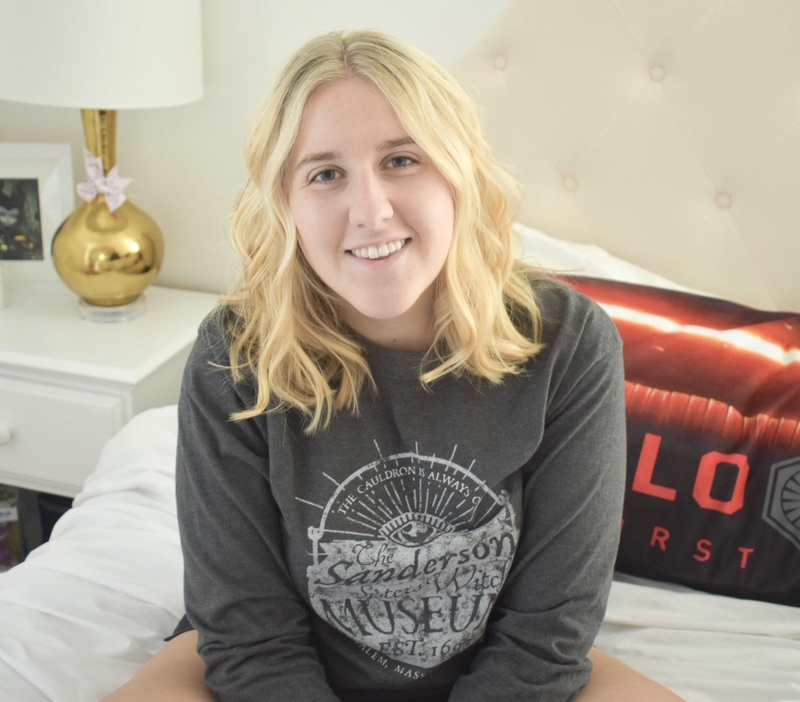 Plus, these photos were taken in the midst of our actual family dinner on paper plates and not in a styled afternoon shoot with perfect natural lighting, so forgive me for that. The base of this dish is sheet pan nachos, which are made by spreading your tortilla chips across a sheet pan, layering these with pre-cooked ground beef and shredded cheese, and placing the pan into the oven. While your nachos are heating, warm your black beans on the stove. 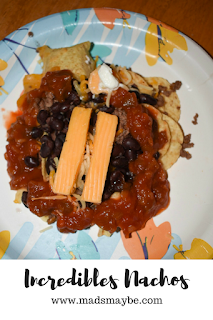 Once the shredded cheese is melted, your nachos are ready to come out of the oven. The next steps make this dish "incredible" because your toppings form the shape of the Incredibles 2 logo! Once you've scooped a portion of your sheet pan nachos onto your plate, start by making an open circle of salsa on top of the nachos. Next, within that circle, make a smaller, full circle of black beans. Finally, you'll want to place two thin strips from your block of cheddar cheese in the center to begin the Incredibles 2 logo. Dot the 'i' of your logo with a circle from the block of cheese and then add a smaller dot of sour cream onto that circle. It can be a little difficult to get the sour cream to cooperate in forming a nice, neat circle shape, but the squeeze pack makes it a little easier than trying to spoon a circle of sour cream out of a regular container. Now that your logo is complete, you can also add your other favorite nacho toppings like lettuce, cilantro, and lime along the sides. And that's it! It's a quick and easy way to add a sprinkle of Disney magic to your day. It may not be perfect, but it's definitely a fun representation of the movie and definitely tastes good! Invite your friends over for nacho night / movie night with the Incredibles DVD before heading out to see the long-awaited sequel. You didn't think I would forget dessert, did you? I'm so excited about my Incredibles 2 dessert — I came up with THE BEST name for it and if someone has already come up with this name, just don't tell me. No bubbles have to be burst today. So, without further ado, here is the Brownie Edna Mode. Get it? Edna Mode like à la mode, but more accurately Edna Mode, the true star of the Incredibles franchise. I love Edna Mode and I'm really excited that her character is starting to do meet and greets at Disney! She's so sassy and stylish, a true inspiration. I knew I wanted my dessert to be inspired by Edna Mode and what better way to represent her than with a chocolate version of her iconic glasses. You can either make your brownies from a box or just get store-bought brownies, depending on what you prefer. My personal favorite brownie mix is Ghirardelli Double Chocolate, which is like $2 at Walmart and Target — they are so good. While your brownies are baking, use melted chocolate either from candy melts or chocolate chips to form the shape of your Edna Mode glasses. I added some of the melted chocolate into a ziploc bag and cut the corner to make a piping tool. I then freehanded a few pairs of glasses so I had options and could pick the ones I liked best. When you're done creating your glasses, carefully place them into the refrigerator so that they can harden. When your brownies are done and you've given your glasses time to harden, you can prep for individual servings. I cut my brownies with a circle cookie cutter to make them a little more photogenic, but that's totally optional. Next, top your brownie with a scoop of your favorite ice cream — my favorite is Baskin Robbins Dunkin' Donuts Coffee Chocolate Chip flavor, which, like the brownies, is so good. I highly recommend this ice cream if you like coffee-flavored things. 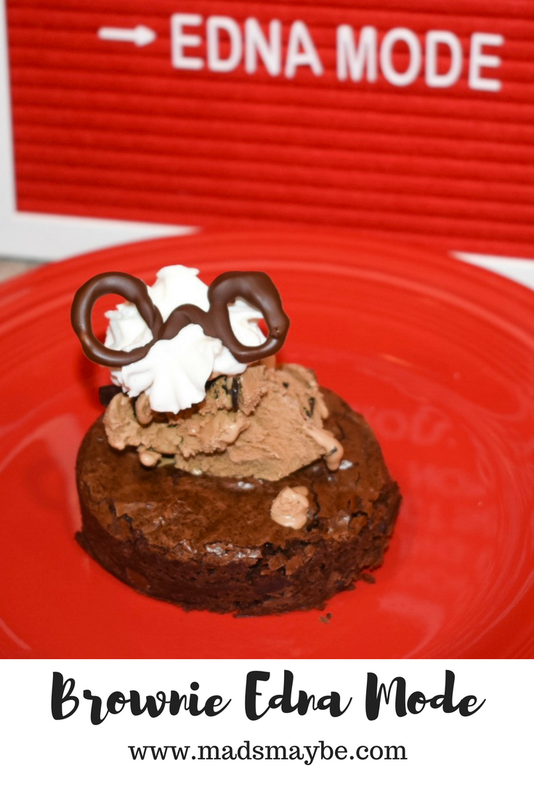 Top your ice cream with a little whipped cream and then place a pair of chocolate Edna Mode glasses right on top and enjoy your brownie Edna Mode! 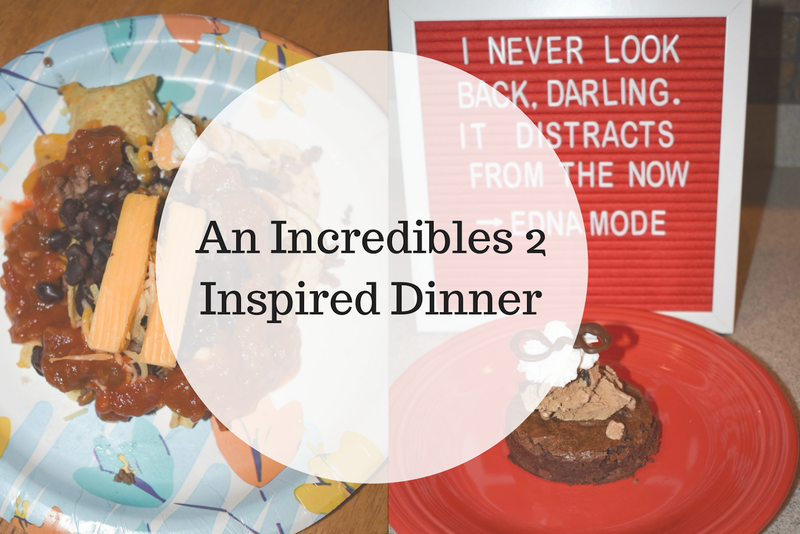 I know I say this at the end of every DIY post, but if you make either of these Incredibles 2 inspired recipes, be sure to tag me on Instagram (@madisoncarter12), tweet me (@madisoncarter12), or post a photo to my Facebook page! I love to see pictures, you guys! Are you excited to watch Incredibles 2? How old were you when The Incredibles came out?